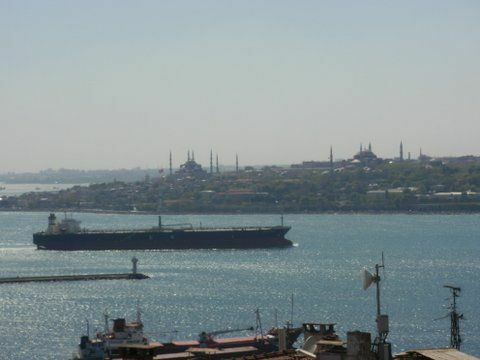 Marvelous sea view, 80m2 penthouse terraced luxury flat, in Harem. This apartment with a shared entrance located on the fifth and top floor of a residential building. The building is located in a quiet location in the Cicekci, 2.5 km south of the center of the district of Üsküdar on the Asian side of Istanbul. The 50 square meter apartment was renovated in 2014 and can accommodate three people. It offers a bathroom with shower and toilet and two bedrooms and a kitchen. The master bedroom, which also air conditioning located, has a double bed (160 x 190 cm). The second room is a single bed (90 x 190 cm). If necessary, you also still stands a sofa bed (100 x 190 cm) are available. An Internet connection and a TV with satellite channels are also available. The kitchen has a small dining area and is equipped with hotplates, mini oven, microwave, fridge, toaster and kettle. The apartment has central heating. The apartment has a 30 square meter terrace, which is furnished with table, chairs and parasol. From here you have a magnificent view of the sea. Parking is not available. The district has several Cicekci pretty cafes and shops. It is located north of Kadikoy, another busy center. The nearest supermarket is only 20 meters from the house. In addition, every Wednesday is 50 meters from the house, a weekly market where you can buy fresh fruit and vegetables. Five minutes walk to the ferry port. From there, take just 15 minutes across the Bosphorus to the famous Sultanahmet area. I am retired Economist. I am living with my wife and 2 daughter. petit appartement de toute beauté, terrasse vaste avec vue de rêve! des propriétaires adorables! un appartement très bien situé dans un quartier calme, vivant et bien tenu - et les traversées vers la rive occidentale sont fréquentes, faciles et plaisantes - - nous recommandons vivement cet appartement et y retournerons avec joie! Harem is a neighbourhood in the Anatolian part of Istanbul, Turkey. Belonging to the Üsküdar district, it lies on the coast of the Sea of Marmara between the centres of Üsküdar and Kad?köy districts, next to Haydarpa?a Terminal. One of the two main coach terminals in Istanbul is located in Harem. Coaches to almost all of the cities in Turkey depart from here. There is a car ferryboat terminal in Harem operated by İDO for a line to Sirkeci, which is directly across the strait. Selimiye Barracks, best known as the place, where famous nurse Florence Nightingale cared for the wounded and infected British soldiers during the Crimean War, is situated on the highway connecting the terminals to the motorway Istanbul-Ankara (O-2). another busy transportation and community centre. Six minutes walk to Harem Ferry Boats, 12 minutes across the Bosphorus to Old Town Sultan Ahmet minutes to country wide Buses, local buses, mini- buses, taxis. Key pick up with owner. Discount depending on length of stay. Rate depending on the number of person.